In this intricate landscape tapestry, a scene of the hunt on horseback is depicted in detail. 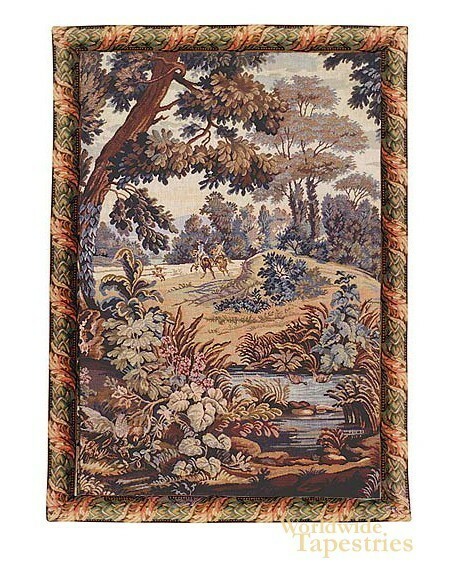 This tapestry is in the style of the verdure or pastoral theme, and is typical of the rich verdures so popular in the 18th century in both Italy and France. In this tapestry, the green, brown and burgundy foliage of Autumn is detailed in the foliage and the river in the foreground as the hunters head off into the woods in the background pastures. The mixture of pointed and curved foliage and shades of autumn colors accentuates the richness of textures in the forestry in the temperate European landscape. This work is reminiscent of the many pastoral scenes of Francois Boucher, known for his many pastoral works in this style of fanciful foliage intricacy to bring a natural scene into life. This tapestry 'Horsemen Depart' is lined with a tunnel for easy hanging.